Prepare to cry. You may be moved to tears by the sheer genius of this simple dish. But first you have to slice a lot of onions. Don't be deceived by the short list of ingredients. This Syrian recipe turns bulgur, eggplant and haloumi into a memorable meal. If you are unfamiliar with halloumi, it is a cheese that is made in Cyprus. We actually ordered a small recipe pamphlet devoted to halloumi from the Cypriot government a few years ago. Halloumi has a great salty flavor and an unusual layered texture that it retains when cooked. You can fry or grill it without the cheese turning into a liquid mess. It is an amazing, unusual cheese that is one of our favorites. For this recipe, inspired by Claudia Roden's The New Book of Middle Eastern Food, we used our Thai Long Green Eggplant to add a nice punch of color to the finished dish. You will be surprised by how many onion slices are required, but wipe away your tears and get cooking. You'll be glad you did. Heat 2 Tbs olive oil and fry onions until golden. Add bulgur. Add the hot stock and cover. Cook on very low heat until stock is absorbed and bulgur is tender, about 20 minutes. While bulgur is cooking, fry eggplant slices in olive oil. Drain on paper towels. When bulgur is cooked, add 4 Tbs olive oil, halloumi, and eggplant. Gently combine. Re-cover and keep the pot on very low heat until the halloumi is soft. Season with salt and pepper as needed. Sprinkle with chopped parsley. Serve hot. This looks so gorgeous! I love halloumi! 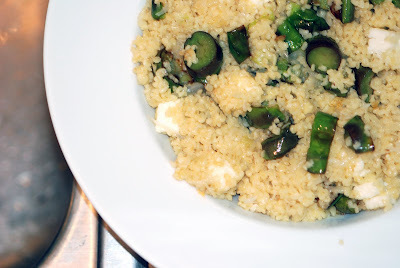 I can't have bulgur, but maybe this would be a yummy dish with quinoa substituted? Sounds lovely. I'm interested in trying halloumi cheese now! 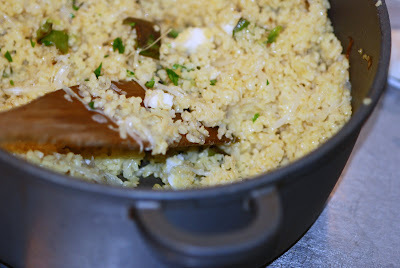 I use bulgur often but I never tried this recipe before. Sounds delicous, especially with the halloumi cheese. Sometimes the simple flavors are best---love the texture in halloumi. Looks great! I have never seen a green eggplant so very intrigued by this...does it taste similar to the traditional purple aubergines? I just found your blog and I love every recipe! Where do I get bulgur in Houston?